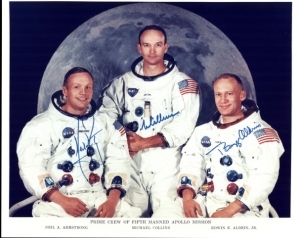 Michael Collins (center) with fellow astronauts Neil Armstrong (left) and Buzz Aldrin in photo marking their moon-landing mission 50 years ago. Michael Collins, one of the three astronauts on the mission to land a man on the moon 50 years ago, will be Marvin Kalb’s guest on a special edition of The Kalb Report Monday, April 15, at 7 p.m. in the National Press Club Ballroom. Admission is free, but seats are limited. Reserve online or at the front desk. Collins flew the space capsule around the moon as Neil Armstrong and Buzz Aldrin descended to the surface for “one small step for man and one giant leap for mankind” and then reconnected with the capsule to return safely to Earth. Kalb calls the flight, which gripped the entire world in July 1969, “a historic, technological feat unmatched in history.” Collins will talk about the flight as well as the future of manned space exploration. Please note that this Kalb Report begins at 7 p.m., unlike all other Kalb Reports. The audience should be seated by 6:40.